So here’s a friendly tip for all of you new music critics out there: if you’re going to start doing a review series like I do and want to make a year-end list of the best albums of the year – as of course you’ll want to do – it’s a very good idea to keep an eye on the genre charts and fellow critics to track albums that you may have missed early in the year. Because trust me on this, you do not want to discover midway through the next year that you might have missed a record that could have had a chance to make that year-end list. Now granted, it’s damn near impossible to hear every record that gets some manner of acclaim – especially because even aggregators like Metacritic aren’t perfect, especially when you have albums that are removed from the mainstream. And nowhere is this truer than in country music, especially from the independent circuit. And thus, when I put out my year-end list of my top albums of 2013, I got questions why High Top Mountain, the critically acclaimed debut album from Sturgill Simpson, did not make my list. Well, the truth of the matter was that I hadn’t had the chance to listen through it when I made my list, a mistake that I knew had to be rectified as soon as possible. So now that I’ve heard High Top Mountain, would it have made my year-end list? Well, it would have been damn close, that’s for sure. The album is great across the board, with great raw texture in instrumentation and Simpson’s thick accent, and the songwriting brings the same rich flavor to the table. Most intriguing to me was that through the hazy guitar tones, the album was rooted the psychedelic country tradition, an outgrowth of the hippie-movement throughout the late 60s and 70s. A distinct oddity in an typically conservative genre, Simpson’s socially-conscious lyrics about weed, crime, and unemployment rang all too true in crossing outlaw energy with psychedelic texture, creating a unique album that easily deserved the acclaim it got. And thus, it wasn’t surprising that country music critics – myself included – were extremely interested in Sturgill Simpson’s follow-up record, Metamodern Sounds in Country Music, a record that promised to be even weirder and more experimental than his last record, something that only enthused me even more. And determined not to miss him twice, I took a look at the album: how did it go? Well, it’s awesome, arguably even better than High Top Mountain simply because this might be the best fusion of psychedelic rock and country music I’ve heard in years, not just a blend of genres through instrumentation and production but lyrically as well. And since I’m a known sucker for great psychedelic rock, this album nearly had me right out of the gate doing everything I love to see in the genre and crossing it with the sharp, witty, and yet emotionally informed songwriting of Sturgill Simpson. And while I wouldn’t quite say Metamodern Sounds In Country Music is perfect – nothing is – it’s damn close to being not just a stellar country albums, but one of the best records you’ll hear this year, bar none. Let’s begin with the first major change from High Top Mountain: the instrumentation and production. There was always a certain amount of rich texture in Simpson’s instrumentation, but there’s palpable, unapologetic grime and dirt here, through every strum of the acoustic instruments, the gentle drumming, the fuzzy yet deft touch on the electric guitar, and Simpson’s rich vocals echoing across the mix, just lo-fi enough to perfectly imitate an older microphone. With all of that, the reedy organ tones are just a bonus to reinforce the late-60s sound – and yet unlike most music from that time, Simpson’s also smart enough to add enough subtle moments of modernization to show he’s making the best of the full mix. It makes the album feel simultaneously both out of its own time and distinctly modern, an interpretation of what psychedelic country would sound like in the modern era and yet showing every rich, organic, almost weathered moment. And like the best psychedelic country, Sturgill Simpson isn’t afraid to both drift into the acid high in songs like ‘Turtles All The Way Down’ and ‘Living The Dream’ before diving into the acid freakout on the most modern-sounding track, ‘It Ain’t All Flowers’, with the inverted feedback, ominous bass, smoky electric guitar tone, and Simpson’s howls that punctuate his choruses. And yet just like Sun Structures by Temples, the other phenomenal psychedelic album thus far this year, Simpson’s melody lines are as tight as ever, meticulously plucked guitar lines woven neatly together regardless of the haze that reflects more natural talent than construction. The interplay between the different guitars is damn close to impeccable, and while there are only a few scattered virtuoso moments, Simpson makes the country familiarity of his hooks work well in succinct, well-positioned moments. It definitely helps matters that Simpson avoids most of the bloated moments that tend to clog up psychedelic rock and keeps his songs defiantly short, with the only real exception being the extended darkness of ‘It Ain’t All Flowers’ – and honestly, it’s so good there that it didn’t bother me anyways. And the more that can be said about Simpson’s delivery, the better. His thick Kentucky accent is admittedly a little tough to get used to, but his tones are smoother and easier to articulate here, with only brief moments of backing vocals to punctuate some of the rowdier tracks. What’s most impressive to me is his emotional range: through songs of existential musings, relationship strife, and harkening back to his past, there’s character and unique personality bleeding through every single track, and it does wonders to making Simpson a compelling performer. Granted, the fact he steps up to the microphone with effortless organic poise helps matters significantly. And yet like all great country albums, it comes down to lyrics and themes – and at first glance there doesn’t really seem to be a unifying theme of this record. The album begins with an ambling desire to get high and from there flits across all manner of leftward-leaning traditional country songs, with plenty more drugs along the way. And from there we get self-deprecating outlaw tracks in ‘Life Of Sin’, ‘A Little Light Within’ and ‘Long White Line’, the last of which is a country standard from Charlie Moore and Bill Napier, meditations on finding one’s passion in ‘Living The Dream’ and on unnecessary self-doubt in ‘Voices’, a sincere declaration of flawed but honest love in the When In Rome cover ‘The Promise’, and a wistful look back on the bonus track ‘Pan Bowl’. And of course the lyricism is genuinely clever and perfectly framed, with Simpson unafraid to show every side of himself, flaws be damned. But throughout the glorious moments of this album, full of painfully real portraits of Sturgill Simpson’s dreams and demons, I kept wondering what deeper themes ran through this record outside of a damn-near perfect reinvention of the acid-soaked edges of outlaw country’s history. In fact, you could make the argument that the album’s theme was the need for country to keep pushing the boundaries and experimenting, to go deeper into the passions, dreams, and darkness that defined the best songwriting of the genre and push it as far as you can go. The usage of the word ‘metamodern’ in the album’s title is telling and important, because that entire philosophy is rooted in exploring the varied mindset between the complete sincerity in Simpson’s approach to psychedelic outlaw country and the shades of richer, knowing nuance in which he frames every single song. He begins the album glorifying mind-expanding drugs and ends it by showing the possible nightmare when going too deep, he preaches the gospel of living one’s passions and then shows the self-doubt and the costs of such a life. He makes an unflinching promise of love and fidelity that is rooted in apologies and pleas for the woman to give him the slightest chance. Hell, he thanks God for his life of sin with an earnest, yet knowing smile! All of that knowing sincerity, that too-honest nuance, really could be described as the most important theme of the record: to push the boundaries of country music, we shouldn’t just expand the sound, but bring real truth to the writing as well. So if you can’t tell by now, I love this album. I love its confessional honesty and the nuance to paint every picture of every song as vividly human. I love the rich organic sound in the blend between psychedelia and outlaw country. And I love that Sturgill Simpson had the balls to push the sound of country with intellect, tact, and texture. In short, this record is one of the best of the year, earns a 9/10 from me, and definitely my highest recommendation. Guys, if you love country, psychedelic rock, or simply just music with the talent, intellect, and heart to back it up, you need to hear this album. This is the sort of music that will do more for country as a genre than anything Florida Georgia Line or Luke Bryan or the rest of the Nashville songwriting machine will release this year. 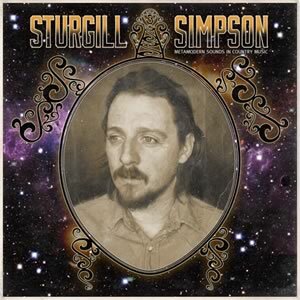 Folks, no jokes here: you need to get Metamodern Sounds In Country Music by Sturgill Simpson. I promise you won’t regret it.